Health and Beauty Girl : Simple Skincare Micellar Cleansing Water: Hype or Love at First Swipe?! Simple Skincare Micellar Cleansing Water: Hype or Love at First Swipe?! I've heard a lot of hype over the Micellar Cleansing waters lately. 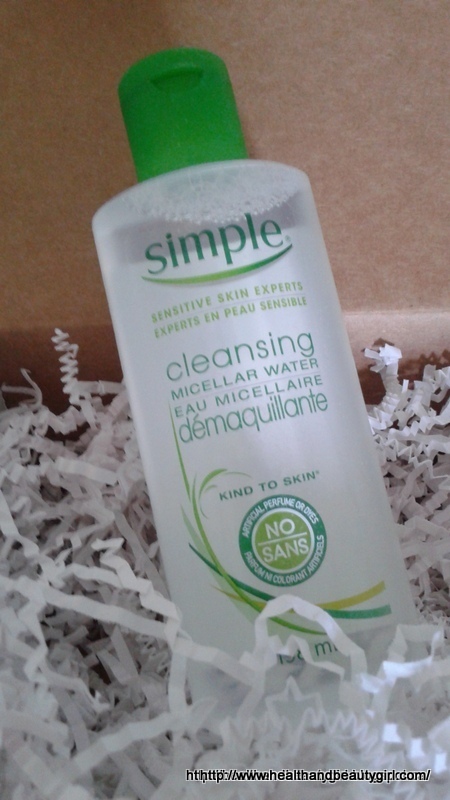 I had yet to purchase one and I was lucky enough to win Simple Skincare's Micellar Cleansing Water in a blog giveaway recently. I had heard about the one by Bioderma for some time and just recently started hearing about other brands, some more affordable, coming out with their own Micellar Cleansing Waters. Since I've never tried this type of cleanser before, I have nothing to compare it to but I definitely don't need that to be able to determine whether or not this product works. Taken from the bottle: "Our Micellar Water is a perfect blend of Multi-vitamins, skin loving ingredients, and gentle cleansers to cleanse the skin." I was pleased to find that there is no fragrance and this is suitable for sensitive skin. I saturated a cotton pad as instructed and wiped off my makeup at the end of the day. Not only was this effective but it was so gentle and soothing to my skin and didn't bother my eyes. It says you can gently wipe around closed eyes, but not to get in your eyes (most products, even eye creams, say this.) I definitely agree with the hydrating claim. I have dehydrated/combo/oily skin and this didn't dry out my skin at all, it left it very comfortable. Oily skin gals may not even want to use a moisturizer after. Love at first swipe? My initial reaction when I first tried this and looked at the cotton pad was "Woah, does this thing have some kind of superpower?!" I was shocked at the amount of makeup on the cotton pad. I flipped the cotton pad over once it was full of makeup and used the other side. Afterwards, I took a makeup wipe to see what was left on my skin and there was practically nothing left behind! I also put makeup wipes to the test to compare; After using a makeup wipe to take off my makeup, using both sides, I then took a cotton pad with the Micellar Water and there was a lot of makeup left behind by the wipes. This was a great way to compare and really spoke volumes. Now, some may prefer to follow up with a quick wash after using the Micellar water, but you can definitely just use the Micellar water, especially on those lazy/tired nights. I'm so glad that I was lucky enough to win this product in a giveaway as I'm not sure I ever would have bought into the hype of the Micellar Cleansers and purchased one. I can definitely say that I am SOLD! And, I'm a tough sell! Have you tried this or any other Micellar Waters? What's your experience? I've tried bioderma and witch hazel lotion - both were quite good at removing general base/powder makeup. I'm still looking for a micellar water that will adequately remove my non-waterproof mascaras! I've used the Garnier Micellar Water with good results and I received a bottle of the Bioderma Micellar Water at the Glamour Affair event I recently attended but I haven't used it yet. I think you have a great idea of utilising Micellar Water in a pre-packaged wipe! You could have a best seller on your hands! This sounds like a really nice product! Thanks for the review. I LOVE this stuff! I too was shocked to see how much makeup it takes off AFTER I have already taken off my makeup! And I love that it is pretty cheap at walmart. I just picked up some Simple brand wipes as well. Great review! I've been wanting to try this product out but have never used a cleansing water and wasn't sure if everything I've been hearing was just hype! I'm happy to hear that it's not! Will definitely pick up a bottle of this stuff on my next trip to Target - it sounds amazing! Thanks! I never even had the urge to buy it, I figured it was all hype! I'm so glad I won this because it's amaze-balls. lol. Lately I've been hearing about a lot of gals using it as a toner and having noticeable benefits to their skin. I know it's packed full of good ingredients so I'm going to try this also. I hope you love it also!